In 1939, the concept of having an Ohio River Museum for the purpose of preserving the history of the inland rivers was proposed by a group of rivermen and historians called The Sons and Daughters of Pioneer Rivermen. On March 16th, 1941, The Ohio Historical Society, (currently the Ohio History Connection), seeing value in their vision, offered them exhibit space in the unfinished basement of the Campus Martius Museum. The group quickly filled this space with photographs, models and historical items from river days long past. The dedication was attended by the who’s who of river notables and was followed by a dinner at the Lafayette Hotel. 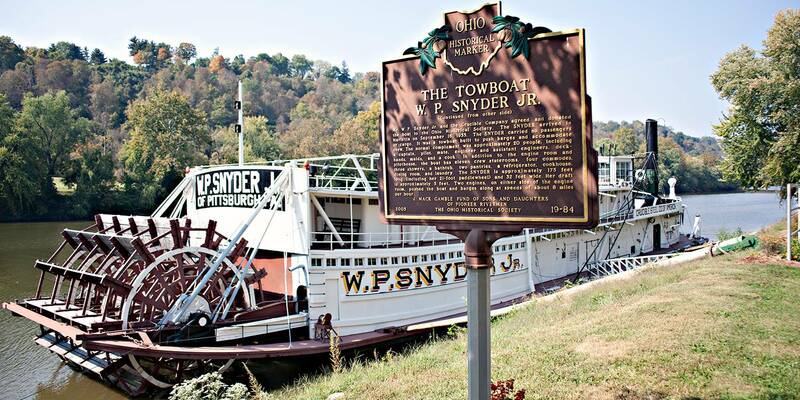 The collection grew rapidly, including the addition of a 179-foot sternwheel towboat, the W.P. Snyder, Jr. The Snyder was built in 1918. 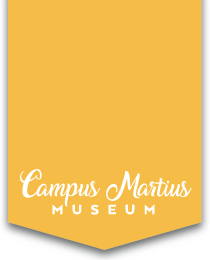 The expansion of the Campus Martius Museum in 1957 allowed for the expansion of the River Museum collection and the addition of new exhibits. With new exhibits added in 1957 came the addition of new lighting and railings built by Bob Thomas to protect many of the objects. The Sons and Daughters of Pioneer Rivermen were able to move to a much larger space adding new displays and additional room to educate large school groups. As the enthusiasm for the displays continued, The Ohio Historical Society along with the Sons and Daughters of Pioneer Rivermen saw the need for a separate Ohio River Museum. In the early 1970’s, planning was begun resulting in a separate new facility, The Ohio River Museum. Construction started on The Ohio River Museum circa 1971 and the museum opened in 1973. The museum was built on the banks of the Muskingum River and in close proximity to the steamboat, W.P. Snyder, Jr. Over the years the exhibits continued to grow including a full scale flatboat, the Tell City Pilot House, and the Schoonover shanty boat. The Sons and Daughters of Pioneer Rivermen, the Ohio History Connection, and The Friends of the Museums look forward to future expansion and additions.